FDI World Dental Federation (FDI) released the results of a survey from 13 countries, which asked parents with children aged 5–16 if their child's school provided lessons on good oral care – and the UK came last. The survey reports that UK schools rank last in promoting good oral health. When asked if their child's school provided lessons on the importance of good oral care, only 29% of parents from the UK said this was the case, which was dramatically lower than the results from 12 other countries. This puts the UK at the bottom of the list behind USA (53%), Australia (54%), Germany (69%), China (77%), Saudi Arabia (81%), Poland (84%), Morocco and Algeria (86%), Indonesia(87%), Brazil and India (91%), and Mexico (93%). 49% percent of parents from the UK also 'didn't know' how often their child's school gave lessons on good oral care, with parents from Australia and the USA not that far behind at 35% and 32%, respectively. This was in stark contrast to the results from Germany (19%), Saudi Arabia (12%), Poland (10%), China, Indonesia and Morocco (9%), Algeria (6%), India(5%), Brazil (3%) and Mexico (1%). She emphasised that 'schools must be encouraged to teach children about good oral care'. In response to the survey findings and to help teachers and parents Act On Mouth Health, FDI has developed Mouth Heroes for schools, a multimedia teaching resource that provides tools to deliver engaging lessons about the importance of good oral health. Aimed at children aged 5–9 years, Mouth Heroes features a child-friendly spokesperson called 'Toothie', who takes children on an exciting journey to develop health-related life skills. 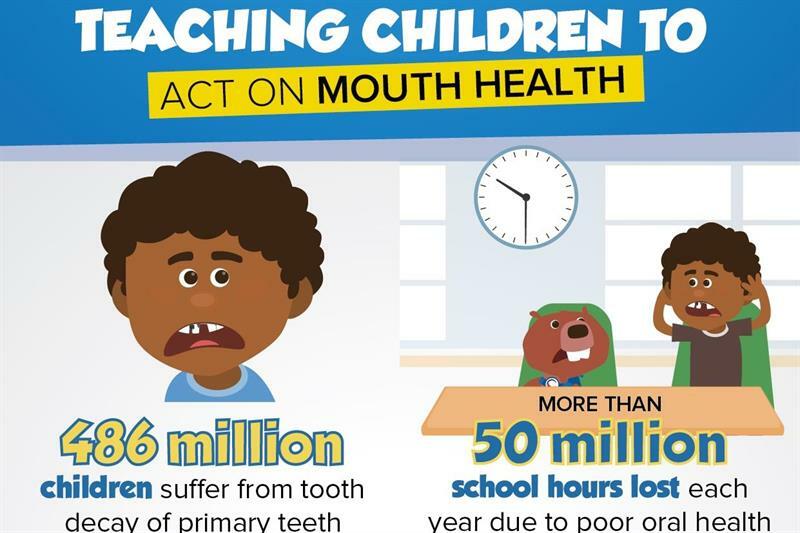 By assisting teachers to integrate oral health into lessons, Mouth Heroes can help drive positive change. In addition, there are many resources available through the WOHD campaign website to assist parents in learning about good oral health practices for their children.